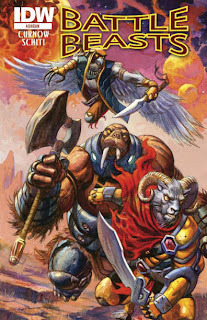 Comics Experience Blog: Bobby Curnow's "Battle Beasts" Hits Comic Shops Today! Bobby Curnow's "Battle Beasts" Hits Comic Shops Today! Writer Bobby Curnow has a new book hitting comic shops today -- and premiering at San Diego Comic-Con 2012 (July 11-15) -- Battle Beasts published by IDW! Bobby wrote Battle Beasts #1, with art by Valerio Schiti (Teenage Mutant Ninja Turtles: Donatello, Dungeons & Dragons: Eberron), and a cover by Dan Brereton! An ashcan version of the first eight pages premiered earlier this year at the C2E2 convention. Battle Beasts is being produced by IDW in conjunction with Diamond Select Toys. The story focuses on a group of renegade Beasts who return to Earth to protect the ultimate weapon (and the human who activated it) from an armada of their violent brethren. When the ashcan premiered, Bobby said, "Getting the chance to help create the new Battle Beasts in comic form has been a fantastic and supremely fun experience...IDW has a lot of experience finding riveting stories in toy-based licenses, and I hope Battle Beasts is no exception." Bobby's new creator-owned miniseries, Night of 1,000 Wolves, is currently in stores. That title features artwork by Eisner-nominated artist Dave Wachter. Congrats on Battle Beasts, Bobby!